Medication Adherence Can Be Predicted? Not long ago, the New England Healthcare Institute released new research showing that patients who do not take their medications as prescribed by their doctors cost the U.S. health care system an estimated $290 billion in avoidable medical spending every year. Clearly, medication non-adherence is a costly and prevalent problem amongst people of all ages who are on a routine medication schedule. This high expense that all would wish to avoid can actually be avoided by simply putting in a little effort that goes a long way. Pharmacists receive copious amounts of information on the patients when they are filling a prescription. They know quite a bit about that patient- where they live, who their physicians are, who else is on their benefit plan, their gender, marital status etc. They also know about the medication- how it interacts with other drugs the patient may be taking, how affordable it is, and what other patient’s experiences with it have been. So, there is a put load of data- more than 400 key factors- in just a single prescription fill. And when you compare these same factors across the thousands of prescriptions they manage each year, they begun to see patterns that enabled them to predict medication non adherence before it even occurs. It should be noted that no single factor by itself is all that predictive. But when you look at the entire constellation of 400 factors associated with a single prescription, you get a pretty clear picture of which patients might need extra assistance to stay on a path to better health. That said, for those who do not fall in the categories mentioned above, it is suggestible for you to get involved with a medication regimen plan that would better aid you follow your doctor’s instructions. 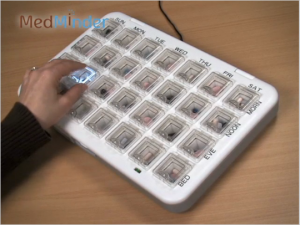 MedMinder’s pill dispenser will promptly inform patients when to take their medications, and not only once, but in a variety of different levels from compartment flashes, beeps, SMS texts, emails and phone calls. Family members and caregivers on the other hand can free themselves of worry by signing up to receive notifications of all patient’s dosage activity, ensuring that they will be the first to know if the patient has missed a dose or have double dosed etc. We have seen adherence go up to above 90% collectively for all patients under our service. It is never too late to get involved in your loved ones or your own life to an extent that ensures you and your loved ones a sense of responsibility, independence and comfort once again!